The grading companion for the CAT Price Guide defines and illustrates the CAT Scale. It gives numerous examples to aid the reader in scoring original comic artwork according to the CAT Scale. The final version will be available in February 2019 as a free PDF download or through Amazon.com as a black and white paperback. 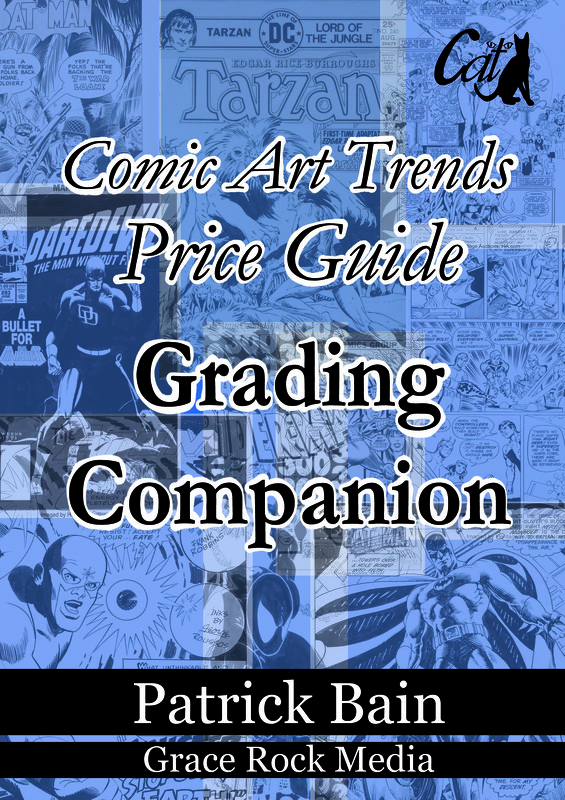 The paperback version of the Comic Art Trrends Price Guide Grading Companion is now available for purchase at Amazon. This is a 78 page paperback black and white version sized the same as the Price Guide that is due for release in February 2019. The paperback version is $5.25 through Amazon, but I'm working on reduced pricing when obtained directly through me or when purchased with the CAT Price Guide. I still like hardcopies of books, comics, and music, but if you can get by with the less expensive digital version, I've got you covered there too. I am currently reformatting the Grading Companion to be more asethetically pleasing in the e-book formats. That will be available soon through Amazon for $1.99. This is a good format for people with Kindle devices or Kindle applications on their phone, tablet, or computer. By the way, the e-version is in color. BUT, the Grading Companion was never intended to be a money-maker! It's purpose is to supplement the Comic Art Trends Price Guide so readers can get the most benefit from the Price Guide. Therefore, it is also available for FREE download on my website... AND this version is in living color (that's an expression, don't make me call legal!). This is an early version, there may be mistakes and omissions. The PDF also does not have our advertisers or their catalogs. So, by all means, check in later and download a new version when it becomes available. JUST A REMINDER to potential advertisers: Advertising in the Comic Art Trends Price Guide Grading Companion is an inexpensive way to partner with me and ensure the Price Guide not only becomes an annual instituion, but that it continues to grow in terms of information and coverage. Advertising is also available in the Comic Art Trends Price Guide Grading Companion. Each full page black and white ad is $50 (US). Ads for the Grading Companion will be included in both the hard copy version sold through Amazon and the free download PDF version. There is also an opportunity to customize the PDF for retailers who want to use the guide as content to enhance an electronic catalog of their own products. Please contact me for more information. 1. The Legion of Super-Heroes is a Grade B Team. 2. 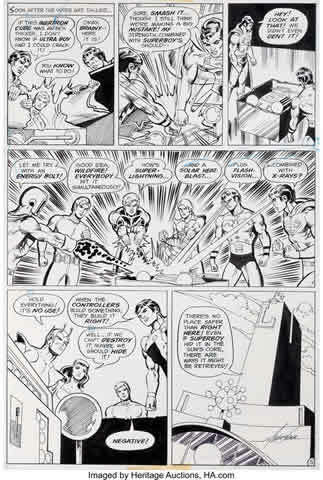 This page features many of the favorite Legionnaires and some good action. 3. Mike Grell is one of the premier Legion artists, particularly during this period. 4. Since Grade B teams get a Plus One when multiple characters are involved, this page rates Superior I5 Plus One to attain the I6 grade. 5. Grade A heroes and teams are identified in the Grading Companion. 6. Plus One artists are detailed in the Grading Companion.